Office Professional. 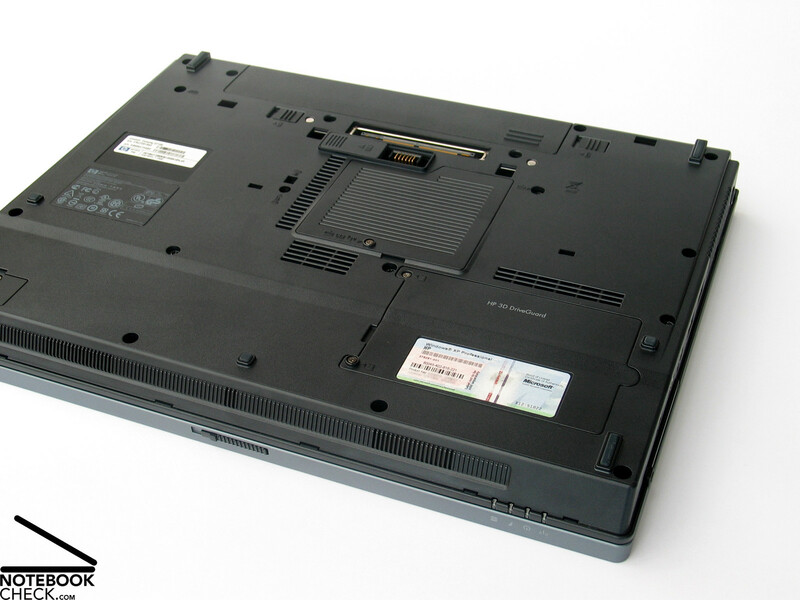 Besides the big 17 inch series HP also offers a new series of compact 15 inch notebooks. One of these is the HP Compaq 6710b. 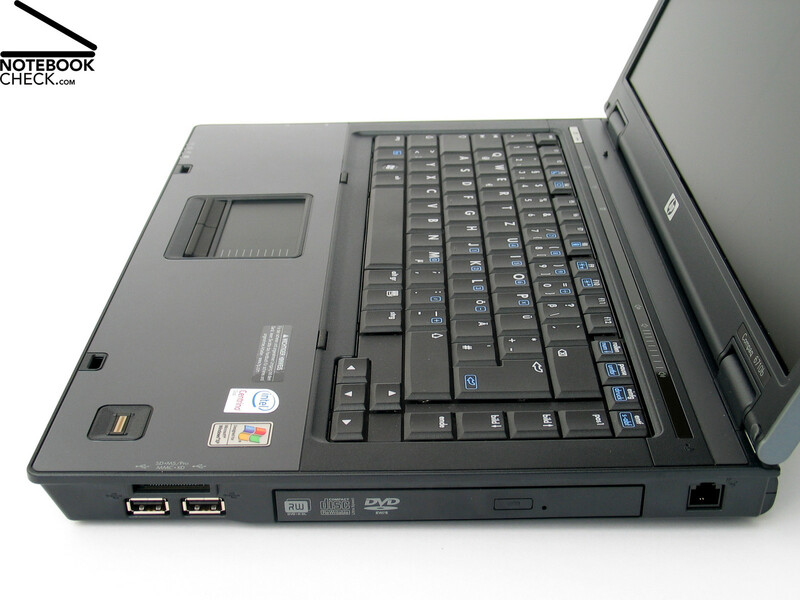 Equipped with Core 2 Duo CPUs and integrated Intel X3100 video cards, the 6710b is a reasonable beginner's notebook of this series. This article provides further information beyond detailed hardware specifications. The new 15 inch business series by HP does not only look alike its bigger competitors by HP, the 17 inch series. It also resembles the 17 inch series regarding quality. 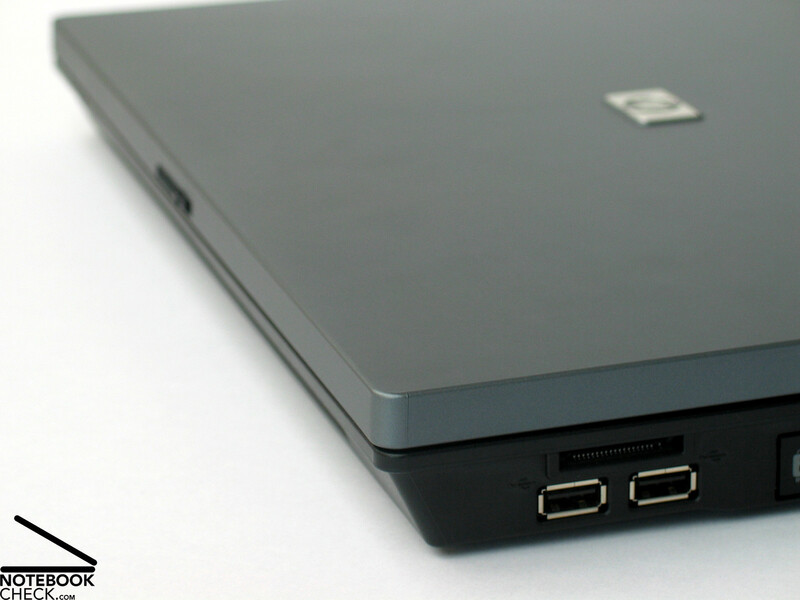 The case, which looks typical HP decent, and business-like, has a good pressure resistance and is very flexural rigid. Although the case is, besides the display cover, mainly made of plastics, the haptics is still alright. While handling the notebook, we could not detect any striking creaking noises or deflections. Also the display's pressure resistance and flexural rigidity and its hinges are alright. However, the ramshorn hook cannot completely prevent a slight wobbling, if the notebook is closed. Regarding interfaces, an office base equipment is provided by the 6710b. 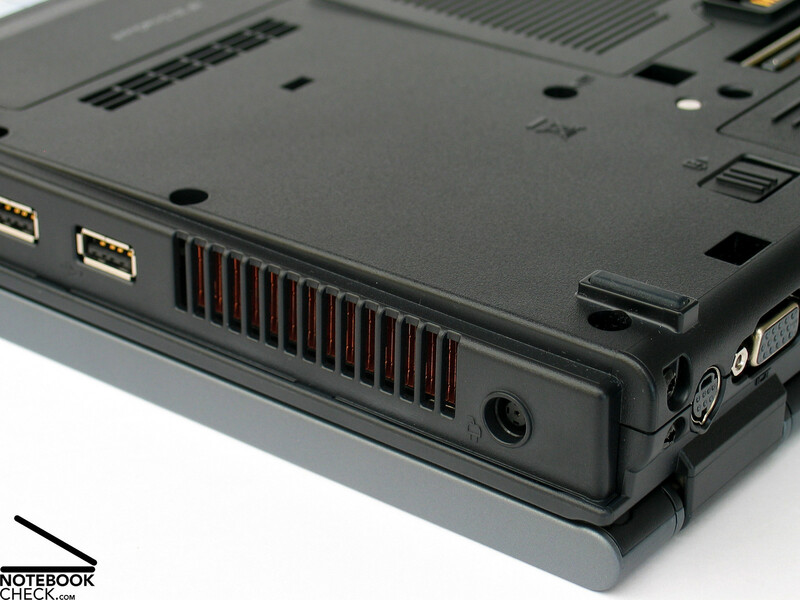 Besides 4 USB ports at the notebook's sides also VGA and S-Video out are provided at the back side. 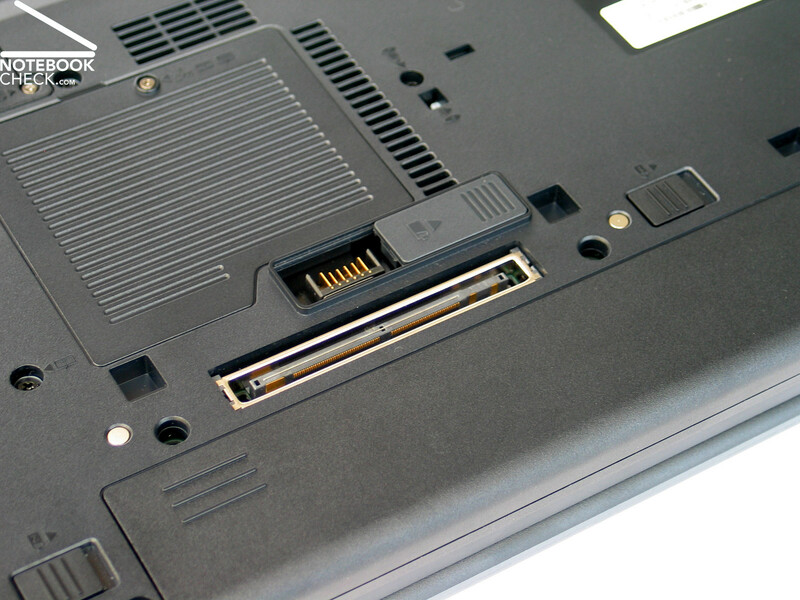 Especially the USB ports are a little bit too far to the front, and can, so, depending on the attached device, limit the user's area of operation. 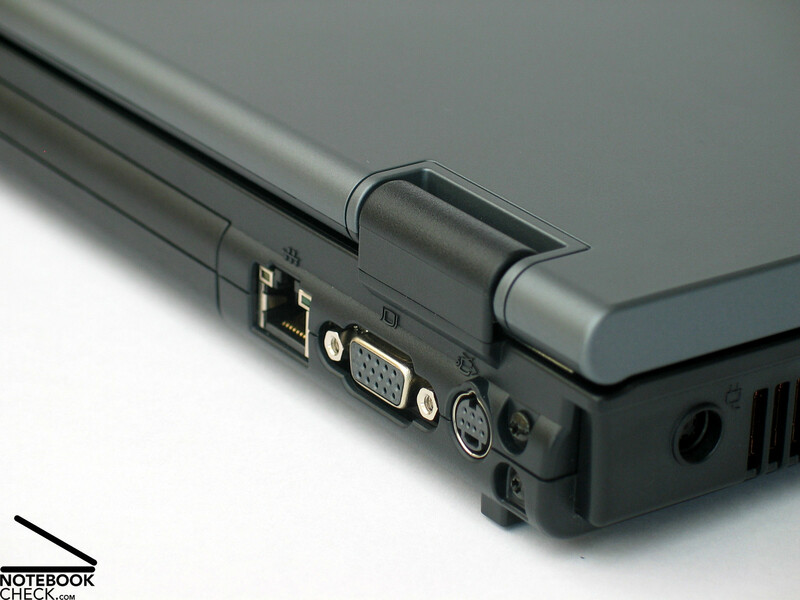 Nevertheless, the notebook is equipped with a docking port at its bottom side. 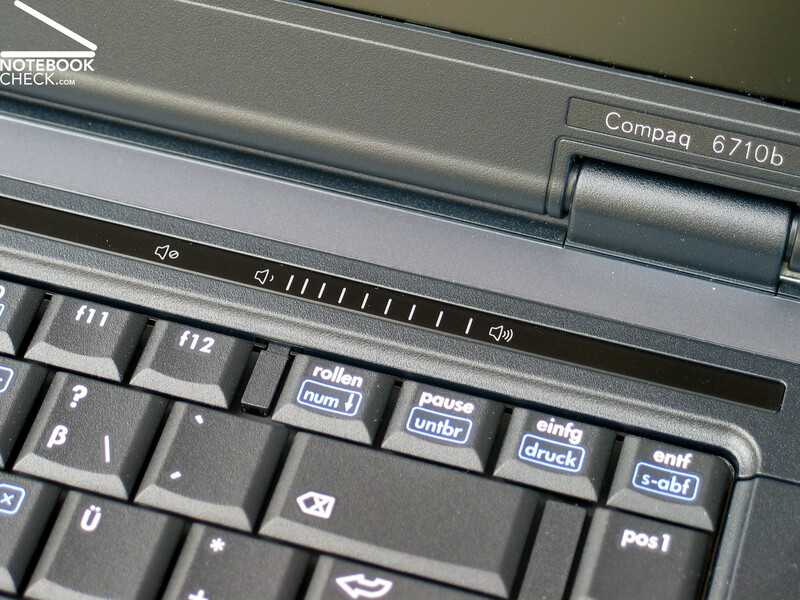 So, the Compaq 6710b's interfaces can be enhanced via a docking station. This can also solve problems with cable spaghetti. 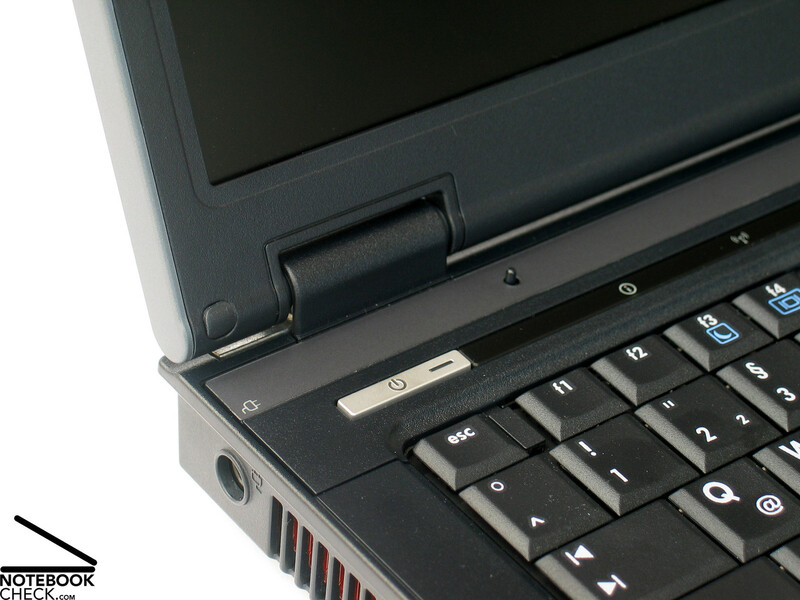 The keyboard of the HP Compaq 6710b is attached tightly to the case. Its keys are spacious and the layout is clear. 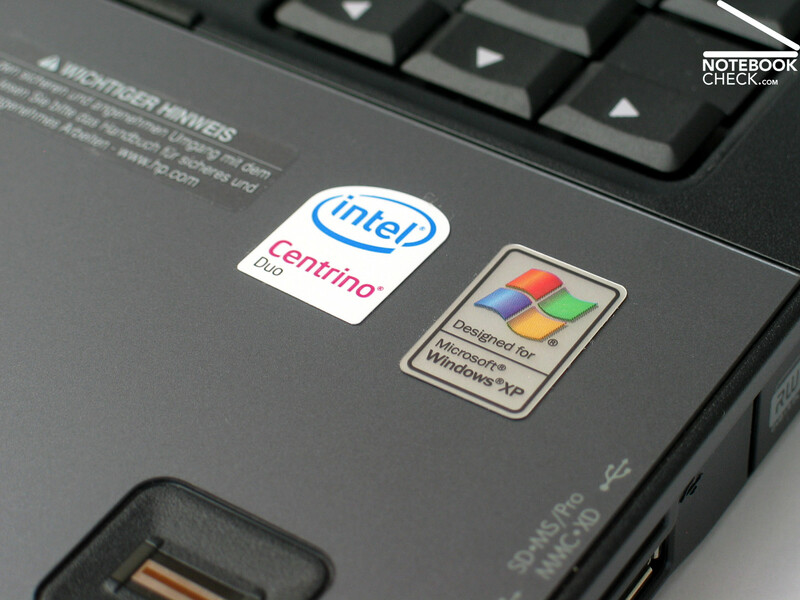 Especially the cursor pad is clearly separated. Alike other HP notebooks typing faces a clear point of pressure, which makes typing nearly feel jerky. Furthermore, a clear clicking noise can be heard, which, however, does not really disturb. 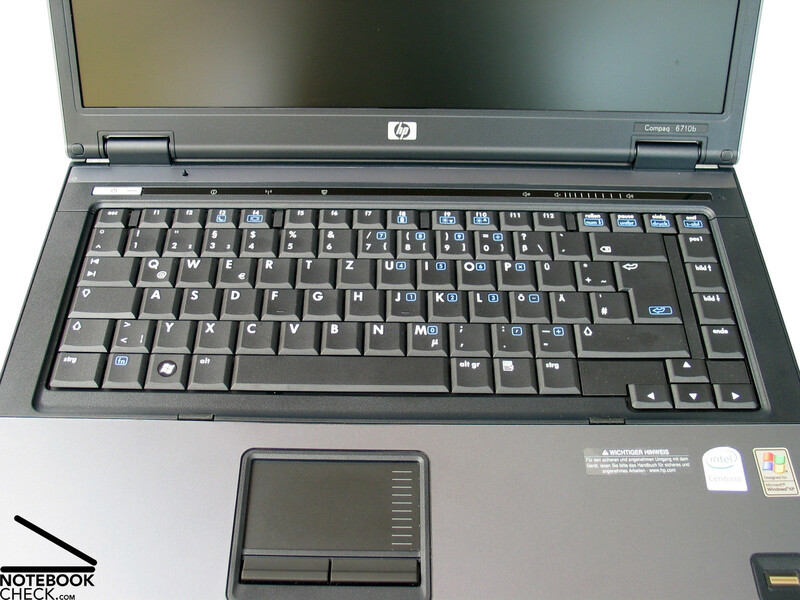 A new feature of this new business series by HP are hot keys which are sensible to touch provided above the keyboard. 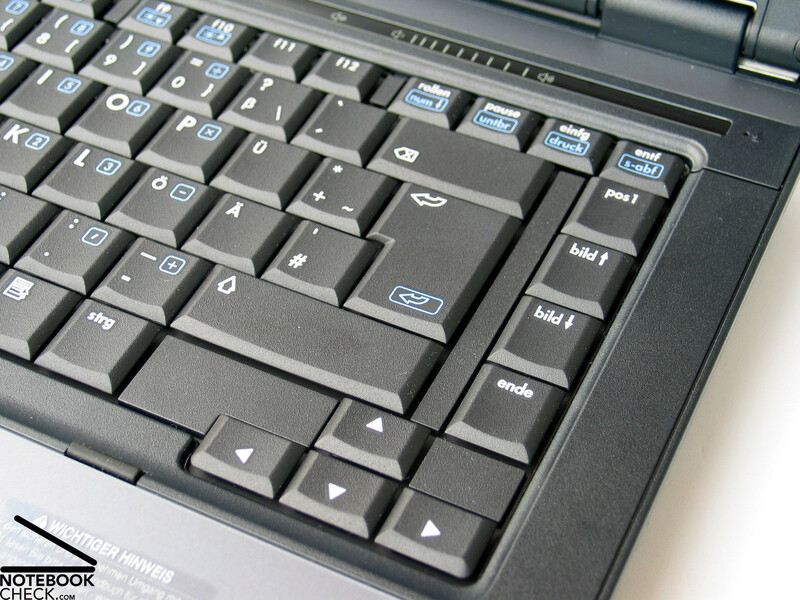 The hot keys can be used by a slight touch and usage is visualized by activated LEDs. 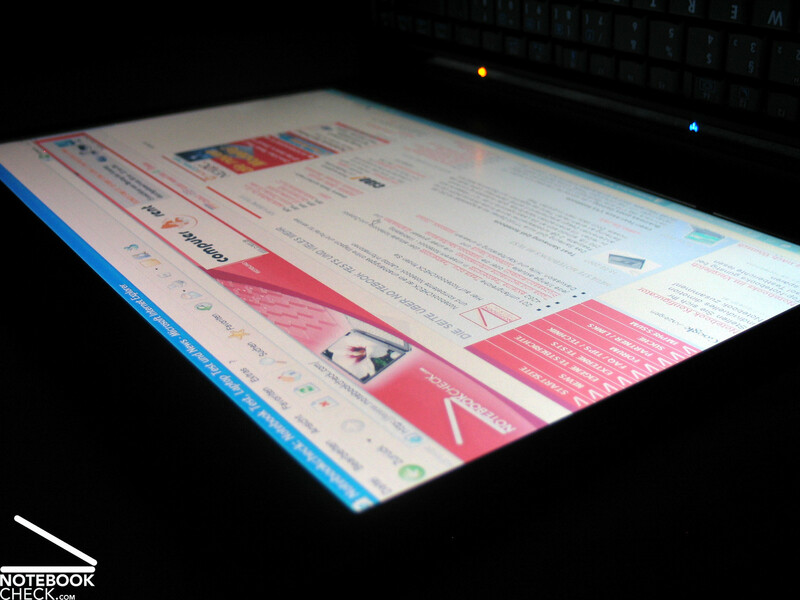 The touch pad reacts well and furthermore, its surface's haptics is comfortable. 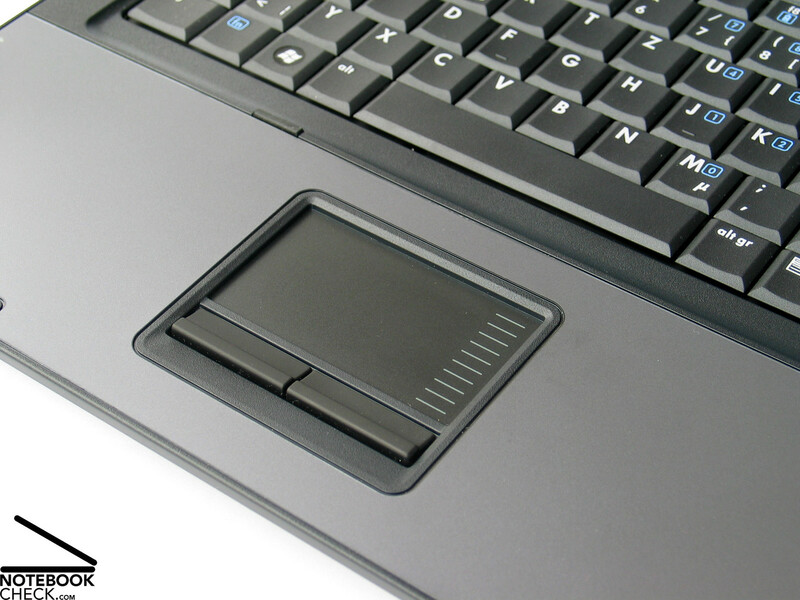 Especially its buttons are very user-friendly, because they have a long, soft travel. 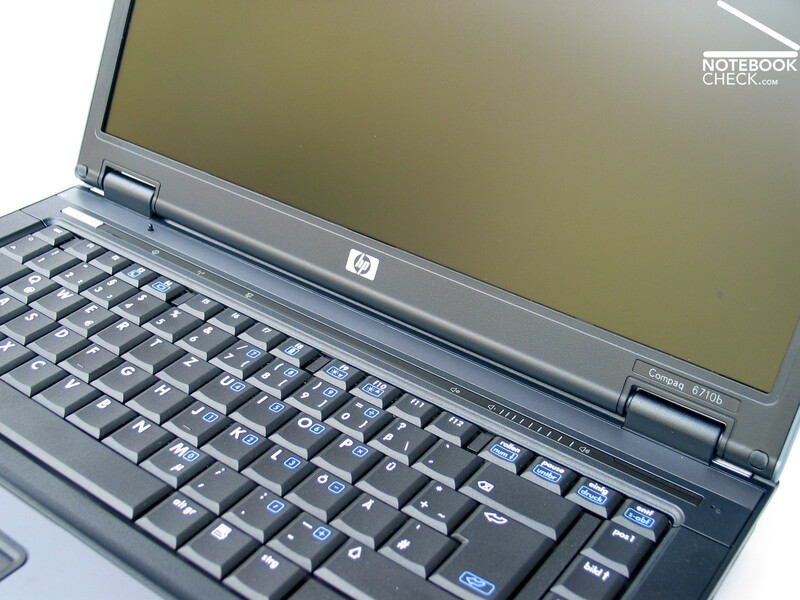 The base version of the HP Compaq 6710b is equipped with a non-reflecting WXGA display with a resolution of 1280x800 Pixel. 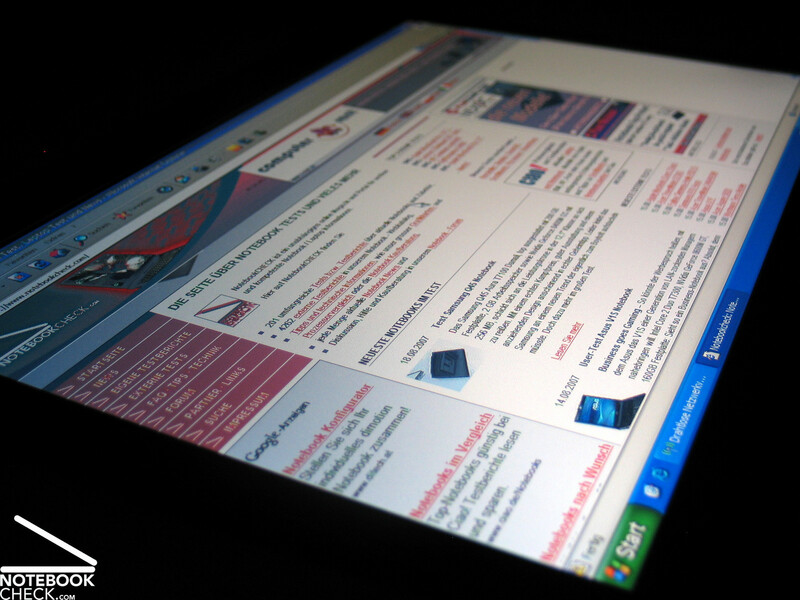 A BrightView version is also available, but, has a reflecting surface. Furthermore, a WSXGA+ display with a resolution of 1680x1050 is also available. 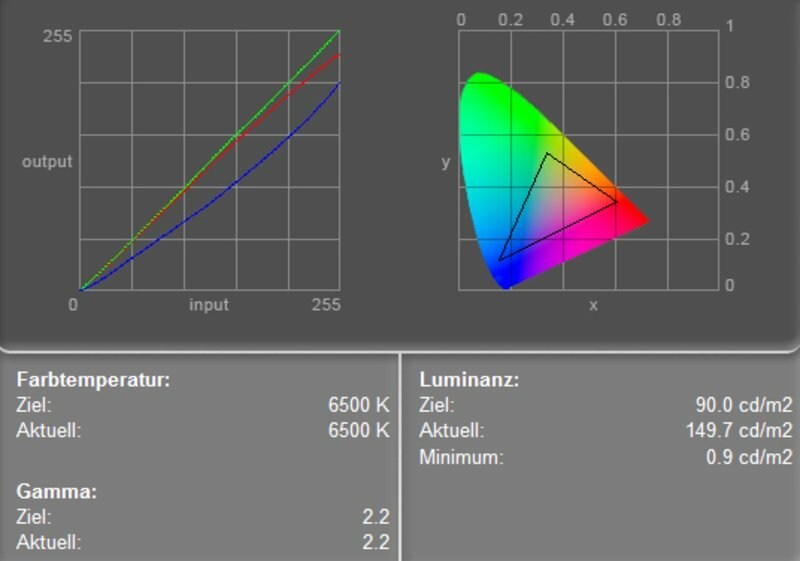 The measured maximum brightness of the provided displays (1280x800, non glare) was 154.5 cd/m². 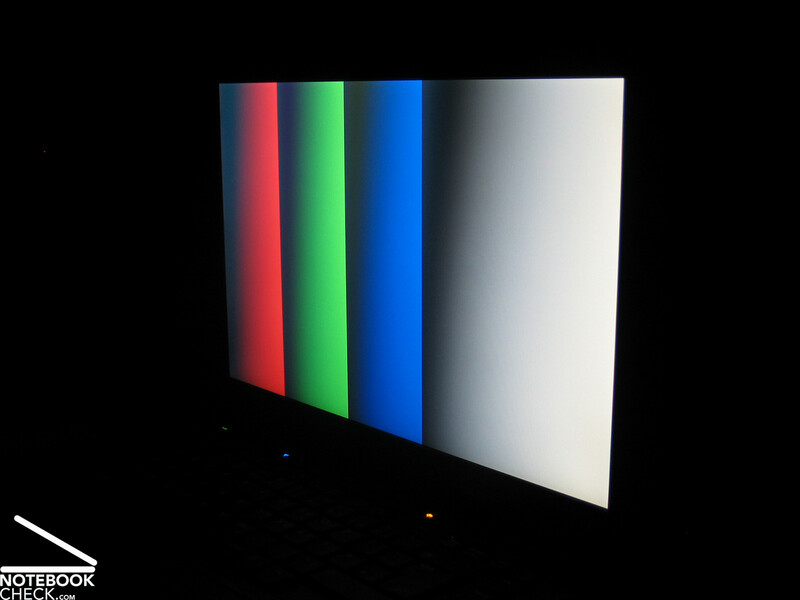 Despite the brightness diminishes at the upper corners to about 135 cd/m² the illumination is still good at 86%. The black value of 0.9 cd/m² and the measured maximum brightness of somewhat above 150 cd/m² give a maximum possible contrast of moderate 172:1. The speed of reaction is alright. During our outdoor tests the display stayed legible, even if its total brightness is a little bit low in bright environments. Of course the matt surface contributes to the good rating outdoors. 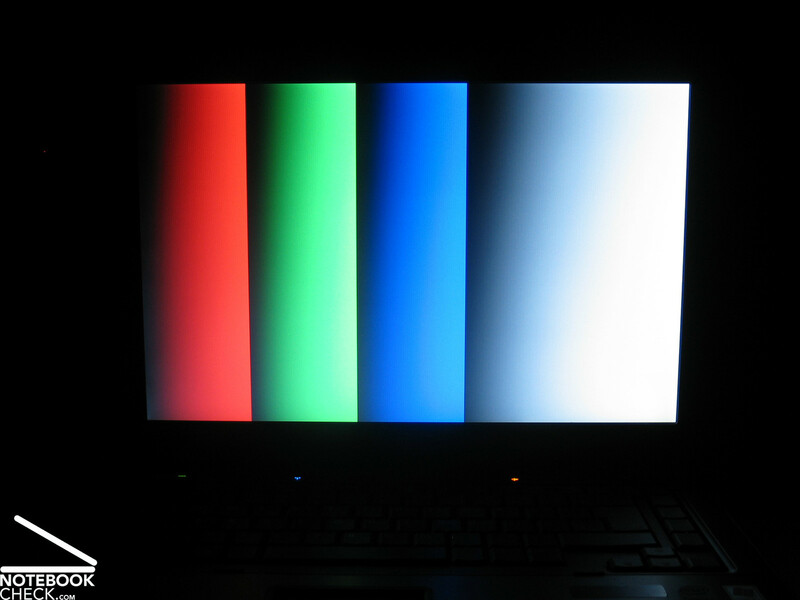 Regarding viewing angles the area of operation is spacious horizontally, and rather narrow vertically, outside it the display darkens respectively whitens as usually. 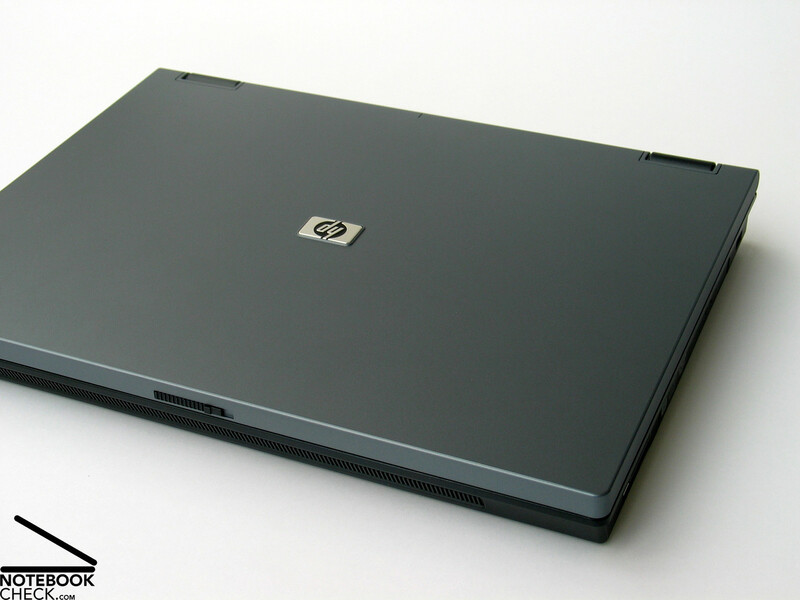 The HP Compaq 6710b is designed a beginner's notebook. 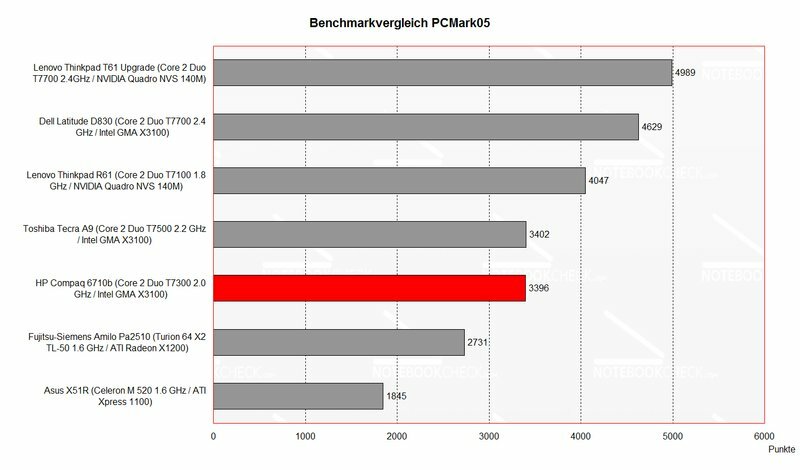 Although, you can choose between CPUs from T7100s to T7500s, the Intel GMA X3100 rather limits the 3D performance. The provided equipment is designated for office and Internet applications without high performance demands. In this field this notebook rates good, also because of its low emissions. 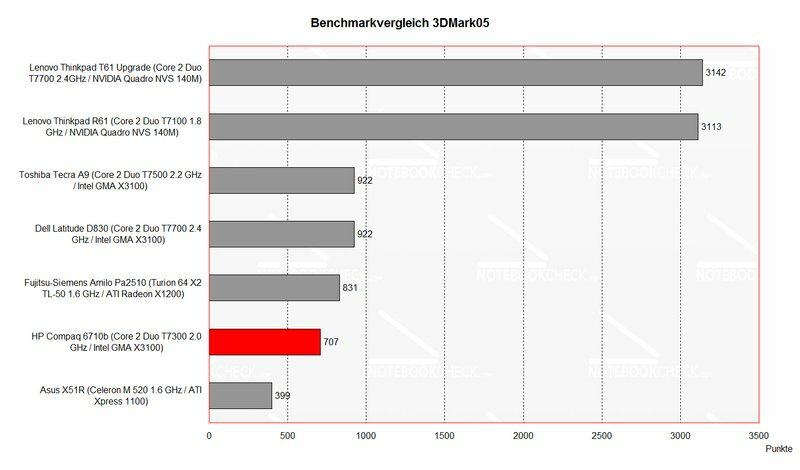 If you demand high 3D performance you should rather choose a notebook of the 8510p/w series. Although otherwise identical, these are equipped with an ATI Mobility Radeon X2600 or a NVIDIA Quadro FX 570M or an ATI Mobility FireGL V5600 video chip. With these video cards also CAD and the one or other game should not be a problem. Furthermore, the 6710b is equipped with 1 GB main memory and a 120GB hard disk with 5400 revs/min. Furthermore, a software bundle with more or less useful applications is also provided. In idle mode the noise of the fan is alright. Although the fan runs permanently, it is not really annoying. Under load the noise level clearly increases, but, during office application the maximum noise level will seldom be reached. The surface temperature is very low. 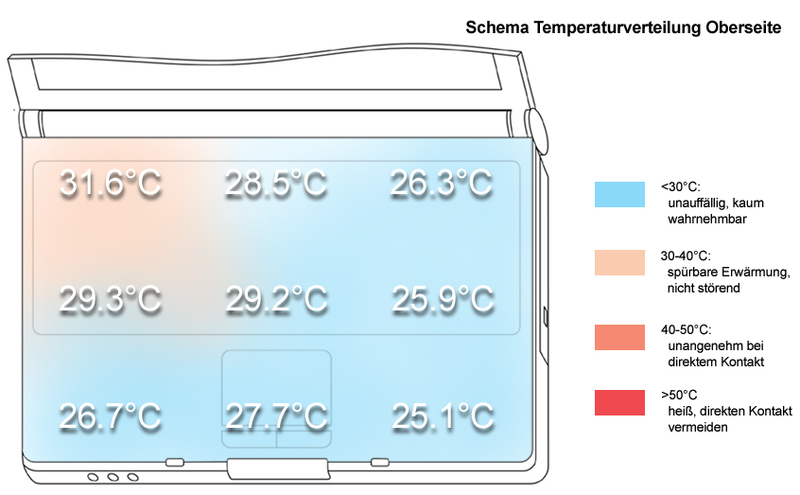 The measured maximums were 31.6 °C at the top side and 36.9°C at the bottom side. The average values are yet clearly below them. The sound of the two speakers of the 6710b , located at the front edge, is passable and their maximum volume is alright. The slightly dull sound and the weak basses do not mind, because it's a business notebook. The sound output via the stereo headphones port is trouble free and provides a good sound. The 55Wh battery provided a very good runtime in our tests. 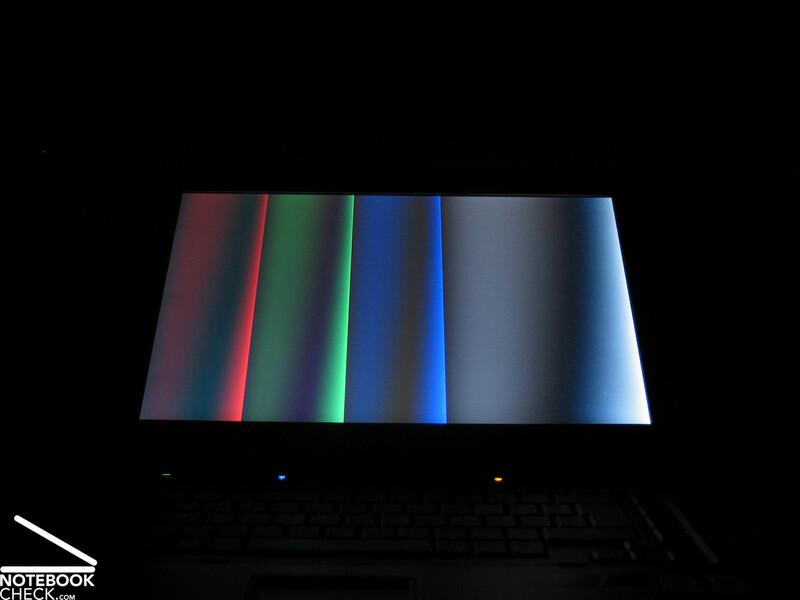 This is basically because of the moderate equipment of the Compaq 6710b. The minimum runtime of about a little more than 1 hours is clearly exceeded multiple times by the maximum runtime of more than 7 hours. You can assume, that the runtime will be below the maximum in practice, but, nevertheless, it will be usable. 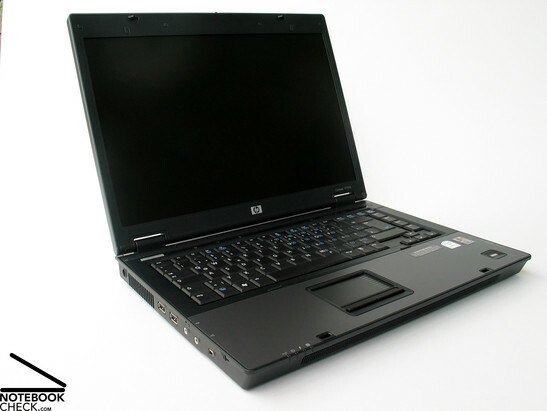 The HP Compaq 6710b was the first representative of the new 15 inch business series we reviewed. Overall, we had a positive impression. We liked the slightly redesigned hot keys and that the successful qualities like robust and stable case persisted. Also the input devices, i.e. keyboard and touch pad were comfortable and proper for intensive use. 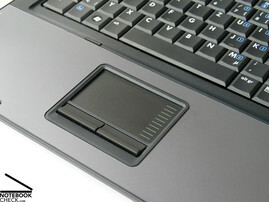 Maybe the touch pad is a little bit too low compared to the surrounding case, however, this is also a matter of taste. 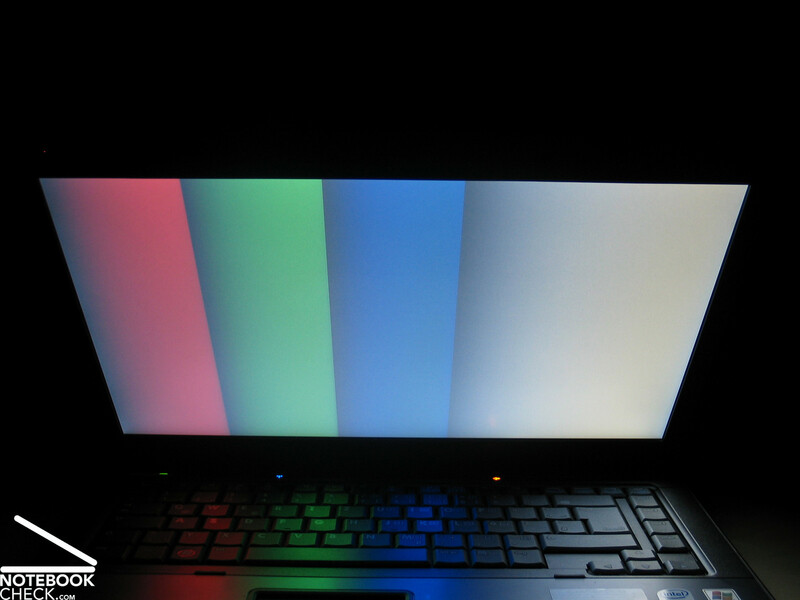 The measured parameters of the provided 1280x800 standard WXGA display were passable. However, it could be a little brighter for outdoor usage. 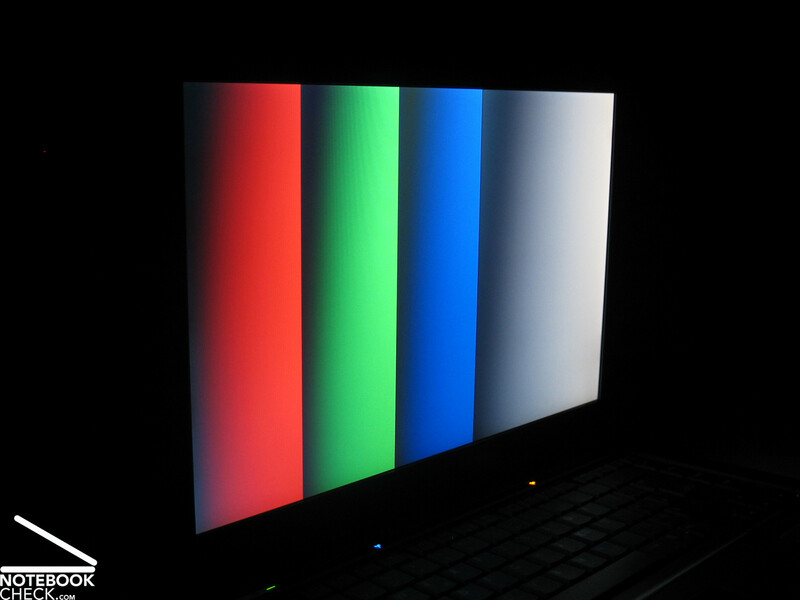 The also available WSXGA panel with a resolution of 1680x1050 pixels could be an interesting alternative. 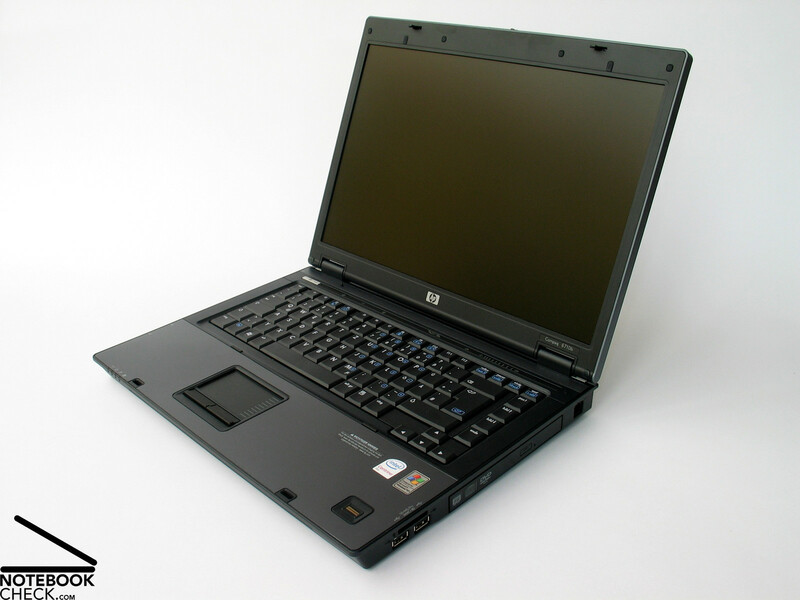 Regarding performance the HP Compaq 6710b is an office notebook with base equipment. In this fields the notebook rates good, also because of its low emissions. 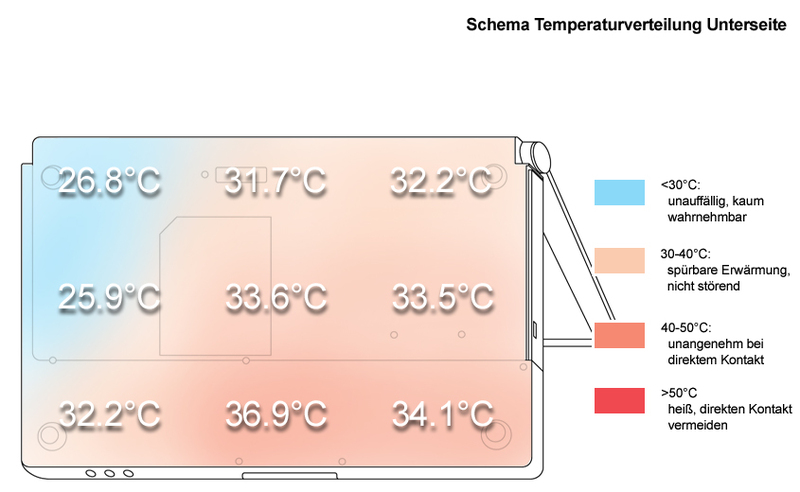 Surface temperature and the noise level of the fan stay always alright. Finally, also another important criterion for office notebooks rates good: The battery runtime of up to 7 hours is remarkable. 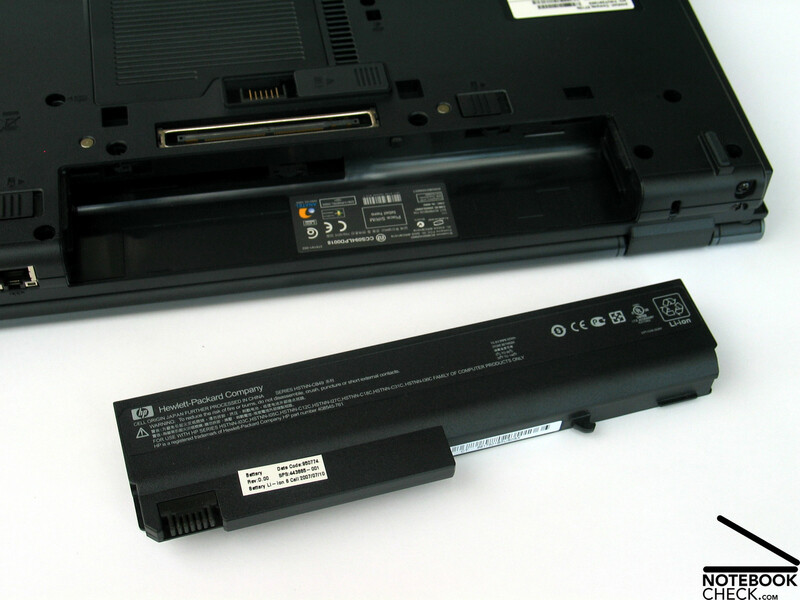 But, take care, under load the Core 2 Duo processor and the integrated X3100 relatively quickly empty the battery. 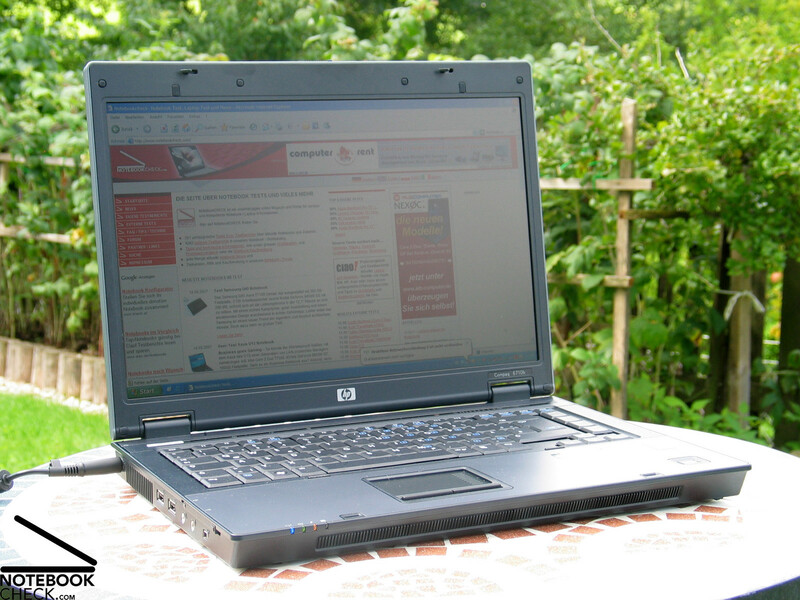 Overall, the HP Compaq 6710b notebook reaches a very good result of 88% in our rating. Such a rating is not often reached by office notebooks (especially considering the input devices, emissions, and battery runtime). Also the surface temperatures stay low. In idle mode the fan was quiet. 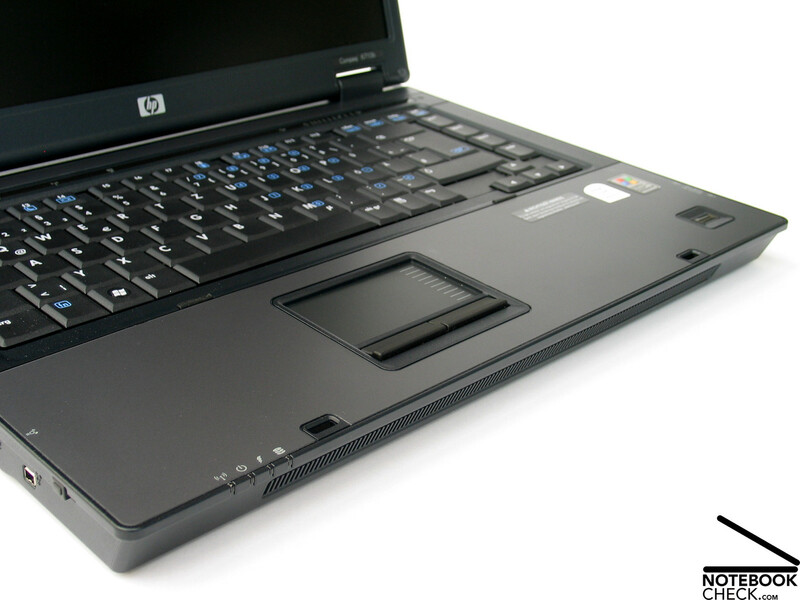 If you demand high 3D performance, you should rather look for a notebook of the 8510 series by HP. The performance is sufficient for internet and office applications. The provided WXGA display rated good in our tests. We were pleased by the hot keys which are sensitive to touch. In general the input devices are alright, but, typing feels odd at first. ..., but, additional interfaces can be provided by a docking station. The haptics are alright too, even if the case is, besides the display cover made of plastics. 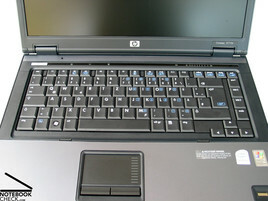 ...we first of all reviewed the HP Compaq 6710b. Finally, also the battery runtime of up to 7 hours could convince.